We recently moved house (a month ago), what with an active toddler and being pregnant again progress on transforming our house has been slow (no) progress. As always it's the poor garden that will be the last to reap any benefits. We are lucky to have a nice size garden with an interesting bump in it. Bubba calls it her hill and whenever the weather has been mild enough she is out there rolling down her 'hill'. 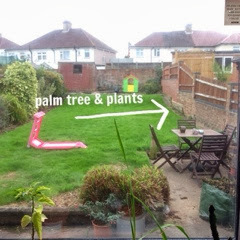 It was the view of the garden out of my kitchen window that sold the house for me, I have visions of watching hubby and the kids playing out there in the future whilst I potter around making dinner and then calling my grass stained and tired out rabble in doors. I'd also love to have some plants to give us a bit more privacy from the neighbours. Hubby has always wanted a palm tree so that'd be first on the list, followed by lovely lavender dotted around the garden to entice more bees. I'd like some 'smelly trees' as Bubba calls them; herbs such as Rosemary and Thyme which she wafts her fingers through. Bubba generally just loves running up and down the garden at the moment. Rolling down the hill and playing on her hand me down slide which she has now outgrown. I'd love to give her a proper slide and something to climb up to because she is a bit of an adventurer at heart. Activity Toys Direct have a huge selection of play centres and this one I can see her loving. I'm a little bit in love with this picnic table and fabulous play house, which i'd probably try and play with too and would be perfect at the end of the garden. I'd love a woodland area where bugs could live and we could explore. I'm not talking on a grand scale as our garden isn't that big! We'd like a tree that could settle and grow as the family does, ferns and a place for bubba to explore and learn, ideally at the back of the garden near the tired old shed (giving us a bit more privacy too). My biggest family makeover would include a decked area with shade so that I can watch Bubba having fun whilst I tend to our new arrival next summer. 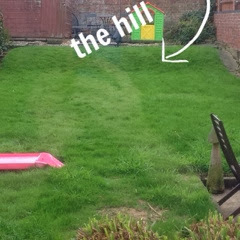 The one thing I wouldn't change would be the 'hill', that we will work around as long as my girl wants to roll down it.